This book was so good I read it in two days. 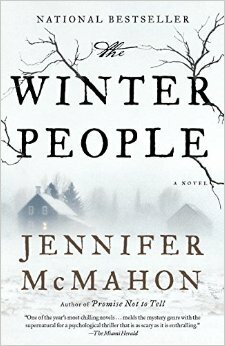 Then I found a second book by Jennifer McMahon (The Night Sister) at a used book shop and read that one in one day. She is a phenomenal storyteller. The Winter People takes place in the fictional West Hall, Vermont, over two time frames – 1908 and Present Day. In 1908, Sara Harrison Shea was found dead on her homestead just a couple of months after the tragic death of her daughter, Greta. The woman kept a diary, and over time the contents that diary made the rounds via town gossip. A century later, 19-year-old Ruthie lives in Sara’s old house with her mother, Alice, and kid-sister, Fawn. They live as homesteaders with chickens, homemade goods, and no internet. Behind the house are the woods where no one is allowed to explore. When Alice goes missing, Ruthie forgoes calling the police and decides to piece together the clues that have popped up: two wallets in the floorboards of her mother’s bedroom, along with Sara Shea’s diary. The mystery that surrounds Sara’s death and Alice’s disappearance challenge Ruthie in every area – what she believes about her family, her house, and herself. When a stranger shows up looking for evidence about her dead husband, Ruthie realizes that the mystery is larger than life. FIVE STARS. I couldn’t put it down, nor could I read it at night. Or while caving.